Published on Tuesday, March 20, 2012. This article appears in the April/May 2012 issue of American Craft Magazine. Heather Knight’s workspace is painted a calm, smoky blue – and it’s very orderly. “I’m the kind of person who cannot begin to work on anything unless my space is clean and organized,” the ceramist says. Her desk is in one corner, where she displays an inspiration board full of images: textiles, fruit, chandeliers, sculptures. 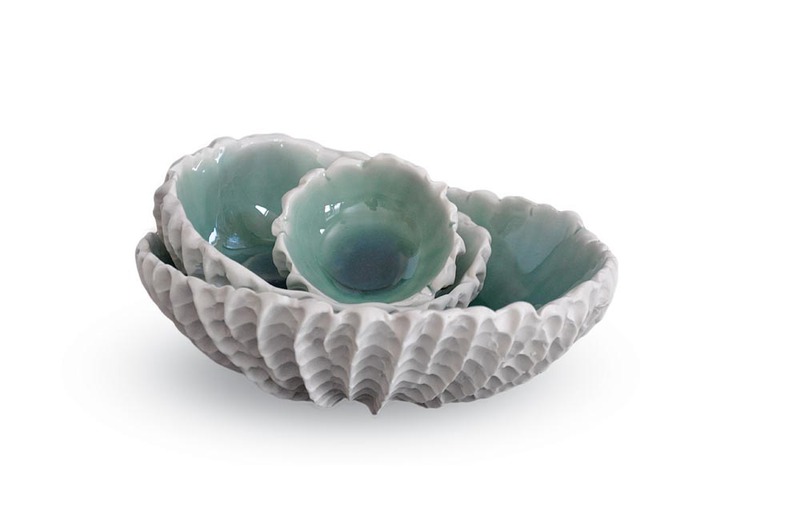 There are bowls throughout, exhibiting natural objects she has collected: sea urchins, shells, twigs, seed pods, rocks. Clean, calm, and well-designed, Knight’s space reflects her work. 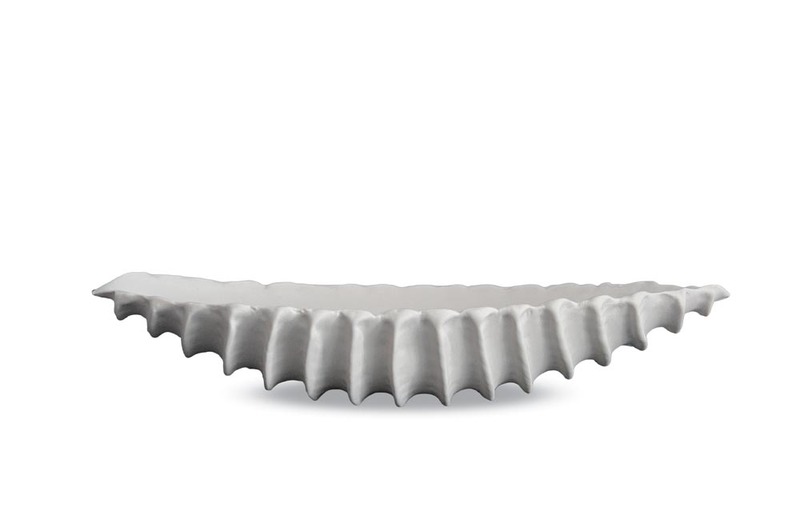 Characterized by textures that sway, point, and undulate, and enhanced by primarily white surfaces, Knight’s porcelain creations look like something you might find rolling around in the depths of the ocean. Yet their crisp execution makes them just as likely to be discovered in the chic spaces of those with an eye for design. 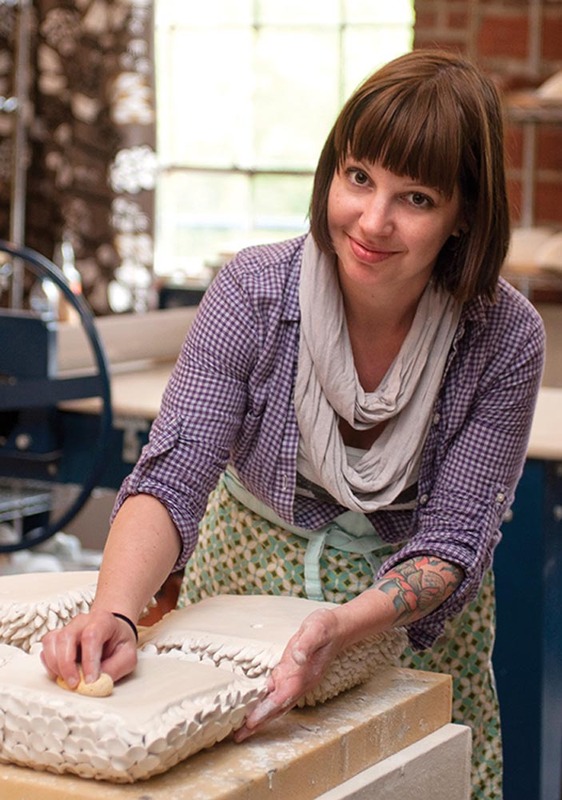 She established Element, a studio in Asheville’s River Arts District in 2007, a year after earning her BFA. 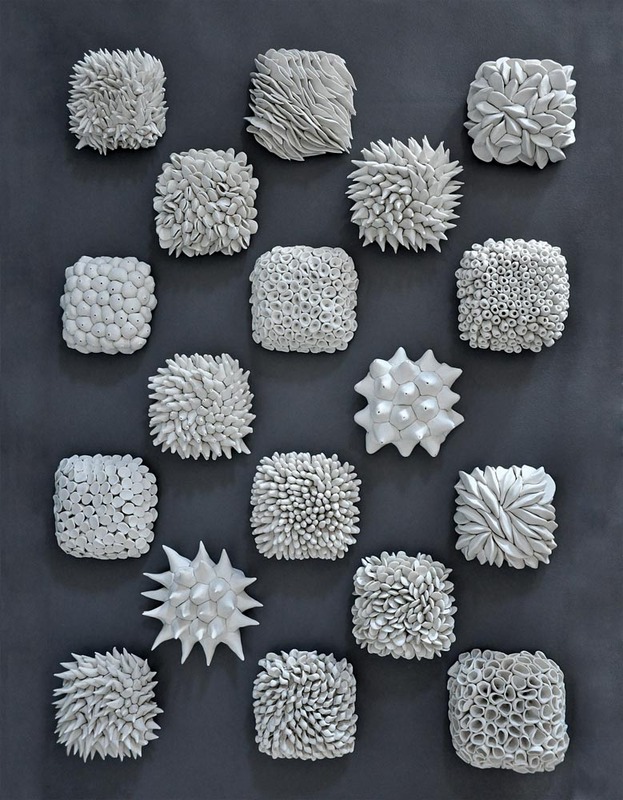 There, she used her Urchin bowls and tiles to explore texture. “I wanted to see how many different applied textures I could come up with,” she says. Knight constructs her work out of slabs, using templates and hump molds to create her forms. Each piece of texture is made individually. Her favorite tool? “A chopstick,” she says. She still has that online shop, but these days also consigns to galleries, sells wholesale to retailers, works with consultants on commercial projects, and supplies interior designers. She spends six to 10 hours per day in the studio (all after lunch; the morning is for administrative tasks), so finding balance is one of Knight’s greatest challenges. Last spring she hired a studio manager who helps with tasks such as shipping, maintaining the online sales listings, and working with galleries and shops. Her husband, who works in marketing and graphic design, lends a hand with marketing, branding, and development. She also appreciates the social aspect that comes with a space in the city’s arts district. But back inside her studio, bringing her pieces to life, she’s on her own. Joann Plocková is a freelance journalist based in Prague.